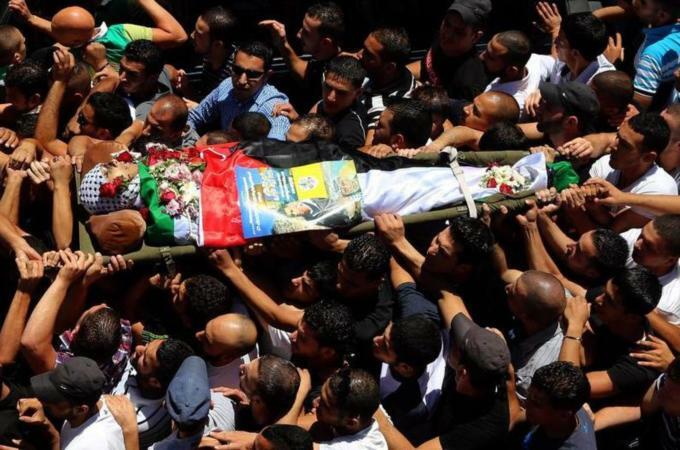 As clashes continue across West Bank, mourners gather for the funeral of Mohammad Al Araj, killed on his 17th birthday. Qalandia, occupied West Bank – Mohammad Al Araj turned 17 on Thursday, with a bright future ahead of him and hopes of studying to be a hotel manager. A day later he was buried in Qalandia, having been shot by an Israeli soldier during protests against the invasion of Gaza. Amid angry chants and a sea of Palestinians and Palestinian flags, the body of Araj was whisked through the streets of Qalandia on Friday to its final resting place in the camp’s cemetery. Araj was shot dead as he marched with thousands of Palestinians from Al Am’ari, a refugee camp in Ramallah, to the Qalandia checkpoint that separates the West Bank city from Jerusalem. Palestinian medics and officials said the boy was shot by live fire, amid what Palestinians have described as the largest protests the West Bank has seen since the Second Intifadah, sparked in 2000. Local residents described the boy was a well-mannered teenager, who had been hoping to study hotel and restaurant management. At Qalandia camp on Friday, billboards and pictures of Araj were mounted across dilapidated walls. Palestinians gathered to pay respects to the Araj family at the mourning tent, where boys had taped an Israeli flag to the ground, to be trodden on as people entered the tent. Men lined the street facing the mosque where Araj’s body had been laid out for the funeral prayer, as the imam lamented the atrocities in Gaza. “We welcomed Ramadan with martyrs, and here we are bidding it goodbye with more orphans and widows,” he said. At the road leading to Qalandia checkpoint, the earth was scorched and stones carpeted the road. A few dozen young boys gathered far from the checkpoint, throwing firecrackers. Israeli soldiers hurled teargas and stun grenades in response. The Israeli military said troops had used “riot dispersal means” against protesters who threw stones and firebombs at them and blocked a road with burning tyres. A senior army official told the Israeli news webiste, Ynet, that Palestinians had “opened fire with Kalashnikov rifles from inside the protest” at the checkpoint.